Note: This method assumes that Apple Health and Walker Tracker are properly connected and that your steps were updating previously from Apple Health to Walker Tracker. 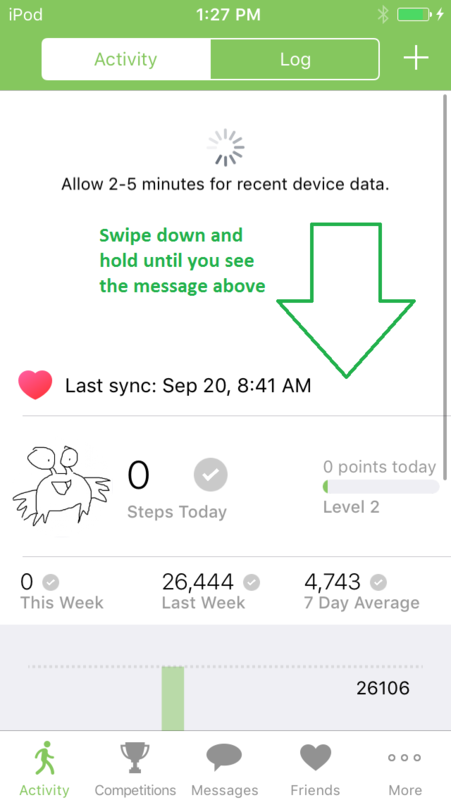 Do you have Apple Health connected to the Walker Tracker app and your steps aren't updating in the Walker Tracker app to their current values from the Apple Health app? If this happens, open your Walker Tracker app and swipe down and hold until you see a loading wheel saying "Allow 2-5 minutes for recent device data". This is a way to manually "force" Apple Health to send steps to Walker Tracker. If forcing the synchronization still does not bring steps over to Walker Tracker, please try rebooting your phone. If the phone reboot doesn't work, uninstalling the Walker Tracker app and reinstalling it may be necessary.